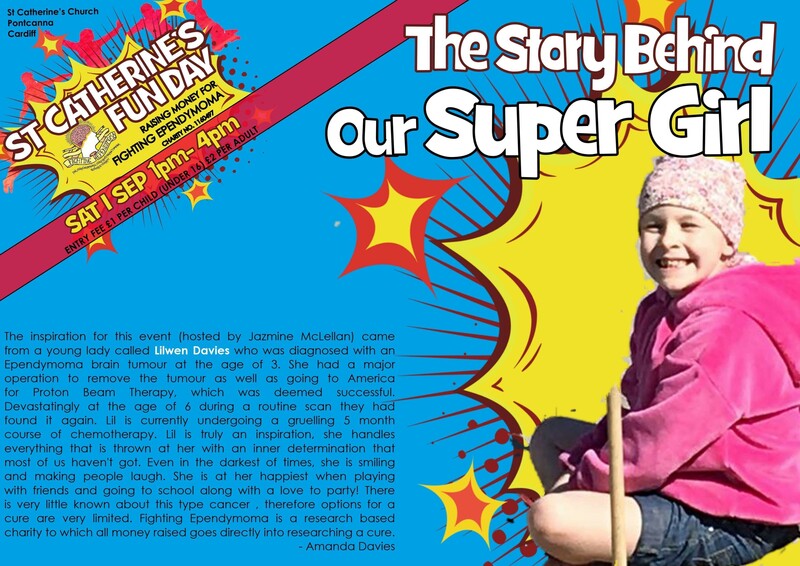 On the 1st September at St Catherine’s Church Pontcanna 1pm-4pm we shall be having a fun day for all ages! We shall be raising money for Fighting Ependymoma (registered charity number 1160497). Their aim is to support world class research into childhood ependymoma brain cancer. During the day we shall be having workshops from Aim sports academy, Nova cheerleading, Sparkle’s Hoop Troupe, Key Creates and some very special guests. Throughout the day there shall be a bouncy castle, local stalls, food and drinks. As well as Ridsdale Photography capturing shots throughout day, not forgetting their family photo booth. Pictures will be available to purchase. From August we shall be selling raffle tickets with the draw happening on the day. We hope to raise as much money and awareness for Fighting Ependymoma along with showing what Cardiff and surrounding areas has to offer for hobbies, interests and local talent. If people/organisations would like to be part of the day then please contact jazmine_314@hotmail.co.uk.